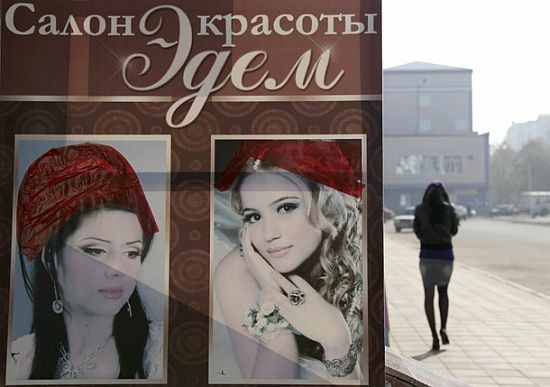 Several businesses in Russia's Chechnya region were ordered this week to cover up the bare heads of women in their advertisements, in what a local government source said was the latest assertion of Muslim customs by the authorities. A band of men whom hairdressers described as being dressed in the uniform of local security forces stormed the "Edem" salon in the centre of the regional capital Grozny, demanding they cover up the hair of two women in their advertisement. "Authorities walked around the area, ripping off ads with women pictured in them. They told us that ads displaying women without headscarves are banned," said a 28-year-old hairdresser, who declined to give her name. "We got scared so we covered them up," she said pointing to a large crimson ad outside where the black and blonde locks of two women in photographs had been plastered over with red tape.